تنهایی, حسین ابوالحسن, ساروخانی, باقر, قورچیان, نادر قلی, براهیمی قلعه قاضی, عباس. (1395). نقش دانشگاه آزاد اسلامی در توسعه اجتماعی جزیره قشم. فصلنامه جغرافیا ( برنامه ریزی منطقه ای), 24(1), 193-205. حسین ابوالحسن تنهایی; باقر ساروخانی; نادر قلی قورچیان; عباس براهیمی قلعه قاضی. "نقش دانشگاه آزاد اسلامی در توسعه اجتماعی جزیره قشم". فصلنامه جغرافیا ( برنامه ریزی منطقه ای), 24, 1, 1395, 193-205. تنهایی, حسین ابوالحسن, ساروخانی, باقر, قورچیان, نادر قلی, براهیمی قلعه قاضی, عباس. (1395). 'نقش دانشگاه آزاد اسلامی در توسعه اجتماعی جزیره قشم', فصلنامه جغرافیا ( برنامه ریزی منطقه ای), 24(1), pp. 193-205. تنهایی, حسین ابوالحسن, ساروخانی, باقر, قورچیان, نادر قلی, براهیمی قلعه قاضی, عباس. نقش دانشگاه آزاد اسلامی در توسعه اجتماعی جزیره قشم. فصلنامه جغرافیا ( برنامه ریزی منطقه ای), 1395; 24(1): 193-205. Qeshm Island in southern Iran, which is considered one of the islands is very important geopolitical position. The island, one of the free ports of Iran, with migration, many cities and surrounding countries to invest faces and the migration of natives of the island is very small. With the establishment of the Islamic Azad University in the island, substrates development in the island became more widespread. 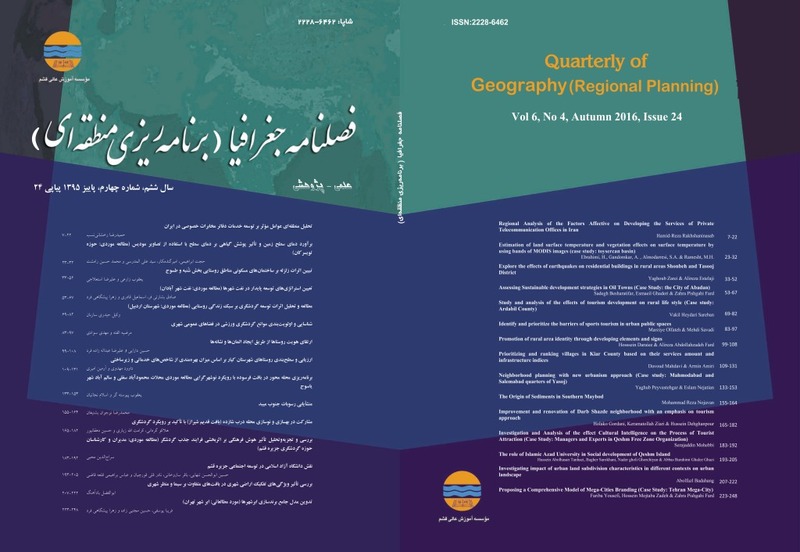 That is why the performance of Islamic Azad University in the areas of social, economic, political and cultural impact and extent of this impact has been studied in this paper. According to the results of the research, all activities of the University in the comprehensive development of the island had an impact. But some variables, such as indigenous, the study of cultural evolution was variable and showed that even pattern of ethnic university capacity has been affected. On the island, social institutions normally act in ways that in other regions of Iran, are active. But the important thing is that on the island, this social model university that is homogenous with the rest of Iran, because there is strong potential for local residents, not a great performance.